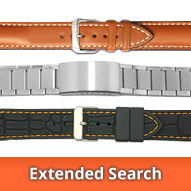 Can't find your watch brand? 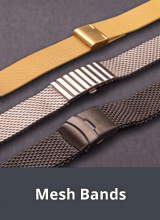 The lug attachment is the combination of the space between the lugs ends of the watch and the lug ends themselves, onto which the watch strap is attached. Lots of wristwatches still have standard lug attachments with straight spring bars for the mounting of the watch. (see image). Your watch has a standard lug attachment? 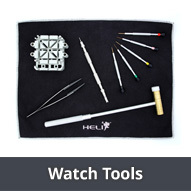 If your watch has a standard lug attachment, then you do not have to rely on an original replacement from the watch manufacturer. 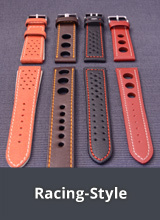 You can choose from our huge range of watch straps with standard lug attachments. 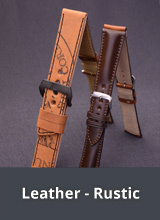 Then you don't need an original replacement watch strap! 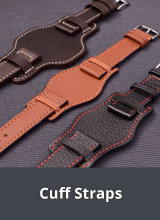 Before you choose, please measure the correct lug width of the watch strap. 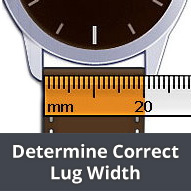 (lug width measurement help). 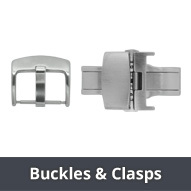 If you would like to use a buckle or clasp which you already have, then the 'width of buckle' should also be observed. 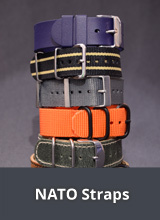 The quickest and easiest way to find a suitable watch strap is to use our Watch Strap Finder.